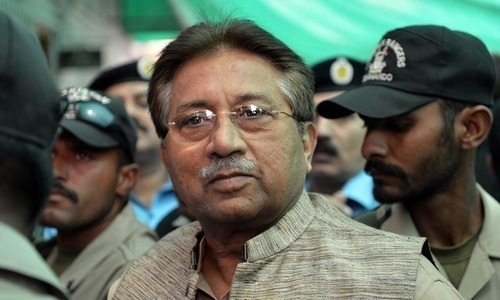 ISLAMABAD: The special court, hearing a high treason case against former military dictator Gen Pervez Musharraf, on Monday ordered the formation of a judicial commission which would go abroad to record the former president’s statement after he refused to testify via video link. Musharraf has been out of Pakistan since March 2016 for ‘medical treatment’. The former president’s lawyer told a special court bench comprising Justice Yawar Ali, Justice Tahira Safdar and Justice Nazar Akbar seized with a high treason case initiated against Musharraf for suspending the Constitution on Nov 3, 2007 ─ an offence for which he was indicted on March 31, 2014 ─ that his client was unable to record his statement via video link since he is indisposed. “He says he is not a coward. He wishes to appear before the court himself and present the evidence in his defence,” the lawyer added. Justice Yawar Ali deliberated whether the case could proceed in the absence of a statement recorded by Musharraf under Section 342 and asked the prosecution lawyer if it was possible to do so. “The accused is in a foreign country right now. According to his lawyer, he is very ill,” Justice Ali noted. Subsequently, the court decided to order the formation of a judicial commission that will travel abroad to record Musharraf’s statement in the case. The members of the commission and its scope will be decided later, the bench maintained, adding that if anyone had objections, they could challenge the formation of the commission before the high court. This is also Justice Ali’s last hearing of the case, as he will be retiring soon. Future case proceedings will either be heard by a new special court bench or by the high court. The case was adjourned until Nov 14.